In many ways, the service desk acts as the face of the IT department. It enables most interactions between users and IT, including problem reporting and resolution, and it sets the tone for support initiatives across an organization. Indeed, an effective service desk can ensure that IT is perceived as a strategic business partner, and not just a break/fix organization. Therefore, finding a service desk solution that enables you to keep users happy and makes your job easier at the same time is a critical task that requires careful consideration. 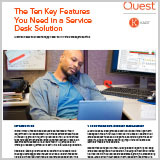 This white paper details the 10 key features to look for in a service desk solution.